Preparing for June's national competition in Wyoming, SUU’s Rodeo Team is an example of commitment, dedication and hard work. The team is ranked nationally in four different categories and has seen triumph during the 2015-16 Rocky Mountain Region Collegiate Competition. The Women's Team are the Reserve Champions Women’s Team for the Rocky Mountain Region and currently sit fourth in the nation. Six Thunderbirds have placed nationally in events like the Team Roping Heeler, Team Roping Header, Barrel Racing and Goat Tying. A shining star on the team is freshman Tenille Rhodes, currently ranked number one nationally in the Women's All-around. Born and raised in Kanarraville, Rhodes has been riding horses since before she could walk. Training her own horse from a colt to the rodeo star he is now, she looks forward to future competitions together. "Boomer wasn't meant to be anything big, he was just an average horse," says Rhodes. "But we started training him daily and he excelled so fast. He's turned out to be a superstar." Rhodes and her horse Boomer are humbled to have seen success on a collegiate level. "You definitely have to be competitive and aggressive when riding, but it is more about having fun – a good attitude is key,” says Rhodes. If you don't compete at your best level, you need to pick yourself up and keep going." This perseverance in training and competing is helped by the team as a whole. Though small in numbers, this tight-knit rodeo family supports each other to reach their goals and to become better in everything they do. 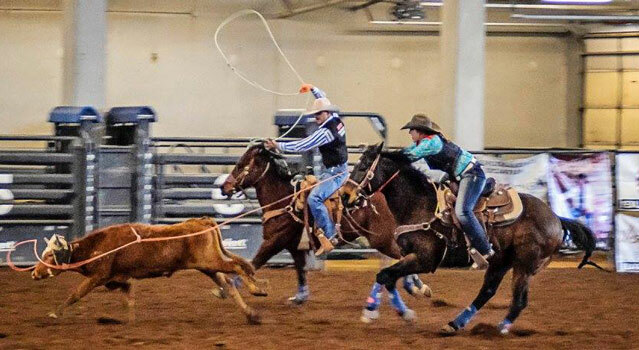 "College rodeo helps these riders get an education," says SUU Rodeo Coach Shane Flanigan. "They learn how to focus, how to work towards a goal and accomplish it, and how to improve themselves. These skills can apply to any aspect of life." These students compete against collegiate-level athletes, most who have ridden horses their entire lives. But through bi-weekly practices and the individual dedication of each member, the SUU team is prepared to face any challenge in the arena or in life. The 68th Annual College National Finals Rodeo will be held June 12-18 in Casper, Wyoming.